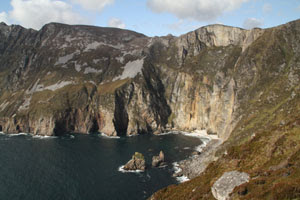 The cliffs of Slieve League are the highest sea cliffs in all of Europe—a breath-taking sight that’s not to be missed if you are traveling in Donegal County on the west coast of Northern Ireland. The gray, chalky limestone cliffs rise steeply from the Atlantic Ocean—nearly 2,000 feet at the highest point. These spectacular cliffs overhang the ocean in a panorama of jagged coastline and cliff face scenes. 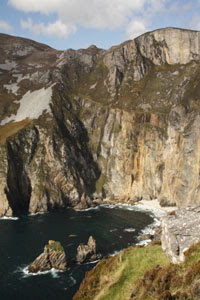 Unlike the popular Cliffs of Moher in southwest Ireland, Slieve League (Sliabh Liag in Irish) is relatively unspoiled. It’s off the main tourist routes, so many visitors don’t make the effort to follow the winding, bumpy road to get there. After arriving at the main parking lot, you can take a shuttle bus along the 1.5 mile path (which we did because we were short on time), or drive your car if you don’t mind driving along a mountainous road without guardrails. Just be careful to watch out for walking tourists. Actually, I’d recommend walking so you can take advantage of terrific views—and photo ops--of the Atlantic Ocean, Sligo Mountains, and Donegal Bay. At the end of the road, you’ll find a platform for safely viewing the vertical rise of the cliffs and the ocean waves crashing against boulders 2,000 feet below (The boulders look really tiny from this distance). For an even better view of the cliffs from all sides, you can walk up an uneven rock path and look back down the mountain. Or venture closer to the sea over a grassy section near the parking areas for a better look at the extreme ruggedness of the cliffs. and requires careful attention along the 10-mile path. Experienced hikers might choose to tackle the ridge known as One Man’s Pass. It’s slow-going but one of the most memorable walks in Ireland if you have the time. Be sure to arrange transportation at Malinbeg at the other end of the 10-mile route as back-tracking isn’t a plausible option. During the summer, hire a boat owner from Teelin to take you on a less strenuous but safer and equally rewarding excursion to see the cliffs from the sea. 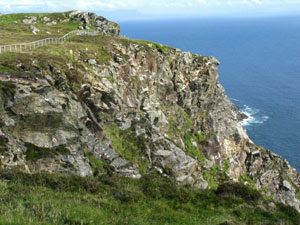 Plans are for the government to take over the site and make the Slieve League cliffs a major tourist destination. Additional regulation will hopefully limit tacky key chain and ice cream vendors that were hawking their wares when we visited. Despite that minor glitch, we definitely recommend a visit to Slieve League, a relatively uncrowded place to experience one of Mother Nature’s outstanding landscapes—and for now it’s free. 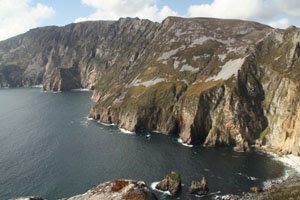 Donegal is one of my favourite counties in Ireland - just along from Sliabh Liag is Gleann Cholm Cille and Malainn Bhig. The reason I've written them in the Gaelic is that it's a Gaeltacht area so all road signs are in Gaelic not English. That includes the useful ones like 'give way' (to oncoming traffic)which becomes 'geill sli' - but the shape of the signs is the same as everywhere else, so look out for that. One place that is signed in English is Glenveagh National Park. If biting insects like you and you're there in mid-July or August buy insect repellent. We have bloodthirsty insects on this side of the Pond like you wouldn't believe. But at least there are no native snakes! Another tip is over car hire. Although Donegal is part of Ulster it isn't part of Northern Ireland (which is part of the UK). If you hire a car at Dublin, Shannon or Knock and say you want to visit Northern Ireland the car hire leaps astronomically. I know because I've done it: I wanted to visit the Giant's Causeway which is in County Antrim which is part of Northern Ireland. But it is possible to join the N15 at Sligo and get to Donegal while remaining in the Republic and keep your car hire costs down. There's nothing that can be done about gas costs though - whether you're in the UK or the Republic it's very, very expensive.